The department of Electrical Engineering offers 4 years Bachelor degree course (B. Tech.) and 2 years Master degree course (M.Tech. in Power Systems). The laboratories are equipped with latest experimental setup. The dynamic, experienced and well qualified faculty exposes the students of Electrical Engineering to a rigorous and exhaustive curriculum designed to bring out the best in them and to keep in touch with the latest state-of-the-art technology. The department Conference/Seminar hall is well equipped with the LCD projector to provide aid in the teaching methodologies. Electrical Engineering is a field of engineering that deals with the study and application of electricity, and electromagnetism. The field first became an identifiable occupation in the late nineteenth century after commercialization of electric telegraph and electrical power supply. In our curriculum, it covers a range of subtopics including electrical power, analog and digital electronics, control systems, microprocessors, and signal processing and data communication. Electrical Engineering is considered to deal with the problems associated with large-scale electrical systems such as power transmission and motor control, whereas engineering deals with the study of small scale electronic systems. Alternatively, electrical engineers are concerned with using electricity to transmit information. Electrical Engineering is arguably the technology which has shaped the world we live in. It is well known fact that all aspects of our lives are affected by the electrical power. Electrical Engineers are responsible for the continued safe and responsible development of this technology in all its applications, through research, design and development, manufacture, service, marketing and consulting. 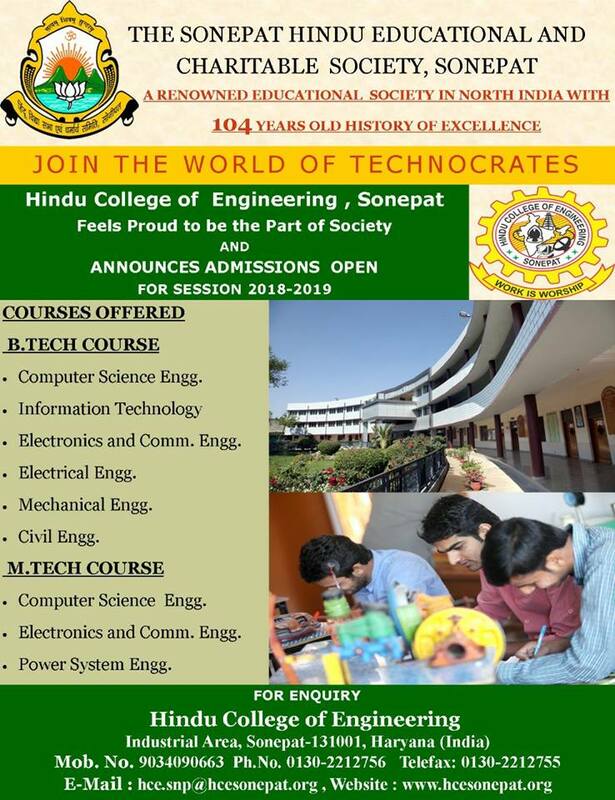 Electrical Engineering is a dynamic and exciting discipline which will continue to serve the needs of society through the economic and responsible exploitation of existing technology and the development of innovative ideas. From the Global positioning system to electrical power generation, Electrical and Electronics engineers have contributed to the development of a wide range of technologies. Electrical engineers typically possess an academic degree with knowledge of both electrical and electronics. The degree generally includes units covering Electrical Machines, Power System, Power Electronics, Control System, Signal Processing, VLSI, and many other subtopics. Student complete their six-week industrial training in the curriculum after Semester IV and VI in various renowned industries in India which give an in-hand experience of industrial practices and problems faced by industries to them. Sometimes this interaction between industry and students gives fruitful results. Normally, the students use to take up the industrial problem and come out with a nubile and real-time solution to the problems, which is worth for the industries. Students choose to specialize in one or more sub-disciplines towards the end of the degree by carrying out a major project during seventh and eighth semester. The Department is equipped with different electrical machines equipments and software's required in the field of electrical power machines, instrumentation, control system, Digital Software packages like MATLAB (version 12A) and Power World Simulator are available for simulation of models and prototypes of modern electrical machines. For practical training, the department is equipped with laboratories like power system, control system, electrical machine, microprocessor lab, electrical drive lab, EMMI lab and Electro Mechanical Energy Conversion Lab. A six week Industrial Training after 4th and 6th semesters and Minor/Major projects in 7th and 8th semester s provide and exposure to latest technologies used in Electrical related fields. The demand for electrical power is increasing rapidly and electrical engineers are in great demand to meet the requirements of the growing industry. Electrical students have been placed in companies like N.T.P.C., Power Grid, B.H.E.L., RRB, NHPC, NDPL, TCS, INFOSYS, etc.